In order to evaluate the potential for increased tourism to Cuba, it is important to consider its performance in the context of other competitive destinations of a similar nature. In this paper, we compare the past and present performance of Cuba to both the Dominican Republic and to Cancún. Puerto Rico, with its Spanish heritage, has been omitted from this comparison because of its direct relationship with the United States and its inherent ability to attract large numbers of U.S. visitors. Cuba is the largest island in the region, comprising almost 111,000 sq km in a land mass that stretches 1,250 km from end to end. There is a population base of approximately 11 million people, of which about 75% resides in urban areas including Havana (over 2 million people), Santiago de Cuba (390,000 people) and Camagüey (280,000 people). The Dominican Republic is located to the east of Haiti, which together comprise the island of Hispaniola. The country has an area of 48,000 sq km and a population of about 7.4 million people. While smaller than Cuba in both geographic size and population, the country’s tourism industry exceeds that of Cuba in the number of arrivals and in room supply, largely the result of the longer term that tourism has been a key economic generator as well as the existence of the U.S. market as a major demand generator. Cancún, a planned resort area within Quintana Roo, Mexico, and not a distinct country or island, is not compared either in size or population base. 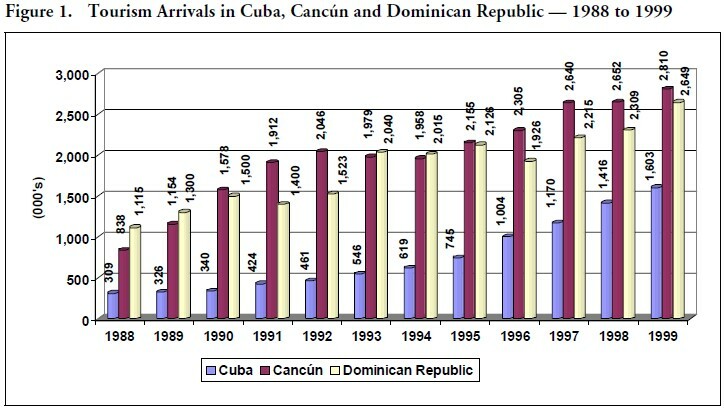 The graph below illustrates the number of tourist arrivals in Cuba, the Dominican Republic and Cancún for the period 1988 to 1999. As shown in the graph, tourism arrivals in each of the three destination areas is very significant, with the combined number of visitors representing a total of 2.3 million visitors in 1988, or 20% of the regional total. By 1999, the three destinations recorded 7.1 million visitors, or 36% of the total Caribbean visitation. Cuba’s re-entry into world tourism occurred in 1988, with 309,000 visitors being recorded. In 1999, it had grown to 1.6 million, representing a compound average annual increase of 16.1%. Cuba has also increased its share of the Caribbean market, from 2.7% in 1988 to about 8% in 1999. Cancún, which has been a popular destination for about 25 years, had 838,000 visitors in 1988, representing 7.3% of the Caribbean market. This volume had increased to 2.8 million in 1999, representing a compound growth rate of 11.6% annually and giving Cancún 14.3% of the regional market. The Dominican Republic, with 1.1 million visitors in 1988 and 2.6 million last year, recorded a growth rate of 8.2% annually over this same period. The Dominican Republic increased its share of the Caribbean tourism market from 9.6% in 1988 to 13% in 1999. The dramatic rise in popularity of these destinations is primarily attributable to their targeting of, and ability to attract, mass tourism. The development of numerous large hotels in a fairly confined area in Cancún created a critical mass that quickly gained recognition in foreign markets. The rapid growth in tourism occurred in the late 1980s and early 1990s with the volume of arrivals jumping from 838,000 in 1988 to 1.6 million in 1990 and 1.9 million in 1991. Over the next few years, the rate of growth slowed, before surging ahead again in 1996 through 1999. The Dominican Republic was the next entrant into the tourism markets, although its later entry was compensated for by rapid early growth in popularity. By 1988, the country was already receiving 1.1 million visitors, but then growth slowed over the next few years (volumes fluctuated from 1.5 million in 1990 to 1.4 million in 1991 and 1.5 million in 1992). In 1993, growth rates picked up again for two years, before stagnating at approximately 2.0 million visitors for the next four years. In 1997, 1998 and 1999, growth started to move forward again quite strongly, with 1999 being higher by almost 15% over the previous year. Cuba was the latest of the three destinations to focus on tourism, rekindling its tourism industry in the late 1980s. In 1988, the first year that the country effectively reopened to international markets, there were 309,000 visitors. Growth rates averaged over 13% annually through 1995, but have since grown stronger. Tourism volumes increased by 35% in 1996, 16% in 1997, 21% in 1998 and 13% in 1999. Cuba’s hotel supply, as applied to “international quality” hotels, grew from about 10,000 rooms in 1988 to 32,300 in 1999, representing an average annual increase of over 11%. Over the same period, arrivals in Cuba grew by 16%, raising the average market occupancy from about 55% in the initial years to just over 60% today. Of the total supply, just over 10,000 hotel rooms are located in Havana, while about 11,000 are in Varadero. Other important nodes of hotel supply are the Jardines del Rey region (2,900 rooms), Santa Lucía, Guardalavaca, Cienfuegos, Trinidad, Santiago de Cuba and Cayo Largo. • Water-based experiences. Diving, boating and fishing are common, and they are also promoted in the applicable destinations. • Cultural tourism. Encouraging visitors to travel throughout the country to observe cultural events and facilities including museums, art galleries, historical sites, music and dance (the ballet in Havana is widely considered to be of a quality only slightly less than the world-renowned Bolshoi in Russia). • Hunting. Cuba actively promotes hunting in its forests and mountainous areas. • Medical tourism. Cuba has established a reputation for certain medical and therapeutic treatments, at costs significantly lower than in North America, Europe and Eastern Europe. The country has a network of hospitals, clinics and spas targeted toward foreign visitors, with dedicated hotel facilities. The Dominican Republic has by far the largest inventory of hotel rooms among the three destinations, with almost 50,000 of the total 106,487 rooms in the combined markets. The supply of rooms has increased at an average annual rate of almost 11% over the eleven-year period 1988-99, higher than the 8% growth in tourism arrivals. The room supply in the Dominican Republic is generally located within 5 recognized tourism zones: Punta Cana and Bavaro Beach; Santo Domingo; Boca Chica/Juan Dolio/La Romana; Puerto Plata; and Samaná. • Punta Cana and Bavaro Beach are located on the northeast shore, in the eastern sector of the country. They boast 50 km of beaches and an extensive range of tourism infrastructure including an international airport which is 20 km from the main hotel supply. Punta Cana and Bavaro Beach have approximately 17,110 hotel rooms, including the 2,000-room Bavaro Beach Resort. • Santo Domingo, the capital of the country and the largest and most important city, has 5,364 rooms, including Boca Chica and Juan Dolio. La Romana, located near the eastern end of the country but on the south shore, has another 1,444 rooms, including the well-known Casa de Campo resort. • Puerto Plata, on the north shore, west of Punta Cana, has approximately 1,014 rooms. • Samaná in the northeast area, has 1,761 rooms. The Dominican Republic’s tourism offering has many similarities to Cuba’s, with a substantial land mass, wide variety of beach areas, colonial heritage and a fairly recent entry into the tourism markets. At the same time, much of the image of tourism in the Dominican Republic is of “all inclusive”1 beach resorts with inexpensive package prices. While this image is substantially a reality, with an estimated 88% of the total hotel supply falling into the all inclusive category, the Dominican Republic has started to move beyond this stage with an increasing selection of high quality traditional and all inclusive resorts. Particular examples of the more upscale product include Casa de Campo (with rates from US$250 to US$300 per night European Plan) and a few smaller, boutique-type products. Cancún first entered the tourism markets in 1974 with just one hotel; it now has more than 24,000 rooms along a stretch of 14 miles of beach area. In 1988, Cancún had 11,891 hotel rooms, and there was a fairly rapid increase in supply over the next few years before the level of new construction activity slowed in 1991. From 1991 to 1995, the number of rooms grew by only 920, or 5%. Supply growth increased again in the ensuing years, although the rate of growth has remained low. With 24,564 rooms today, Cancún has experienced an average annual increase in supply of just under 7%, while tourism arrivals over the same period grew by almost 12%. A review of the hotel supply in Cancún indicates it is typically comprised of larger, relatively upscale products. The hotels are effectively located in three key areas — Cancún Island (the main concentration of hotels along the eastern shore of Cancún Island), Punta Cancún (the western shore of Cancún Island) and Cancún City. • Cancún Island contains approximately 18,000 of the total rooms, in approximately 60 properties. The hotels typically range in size from 40 units to as many as just under 1,000 in the Oasis Cancún. The quality also ranges from economy, to 5-star, with hotels such as the Ritz Carlton and Coral Beach representing the upscale product. • The Punta Cancún area, associated with the Convention Centre and located just east of the downtown area, has about 4,000 rooms within 20 hotels. Major properties in this area include the Hyatt Regency Cancún, Camino Real Cancún and Fiesta Americana Coral Beach. Many of the hotels in this area are larger, upscale products catering to the convention delegates and more discerning leisure travelers. • The Cancún City area, with about 2,000 rooms, is mostly comprised of smaller, lower quality properties, although well-known brand names such as Holiday Inn and Novotel are present. All-inclusive packages are an integral part of tourism to Cuba and the Dominican Republic, while relatively few of the hotels in Cancún offered this category of vacation until the last 10 years or so. Today, new construction of hotel properties with this mode of marketing is proceeding at a rapid pace. In addition, the large inventory of hotels, proximity to downtown Cancún, and large volumes of visitors has given rise to a well developed tourism infrastructure including plenty of freestanding restaurants, bars, nightclubs and retail stores. Cuba’s 32,300 hotel rooms achieved an average market occupancy of 62.6% in 1999. A review of individual market segments shows Varadero with the highest average occupancy, about 74%, while Havana operated at an average of 62%. Other beach areas performed less well, with the Jardines del Rey region operating at 61% occupancy, Cayo Largo at 60%, and Santa María (located north of Camagüey) at 59%. The average length of stay in Cuba is 7.8 days, down from just under 10 days in 1993. The reduced length of stay is attributable to the increased number of flights, particularly scheduled airlines, and the increased number of short-term visits to Havana. The average expenditure, per tourist, is $1,200, down from $1,300 in 1997 and $1,500 in 1995. The Dominican Republic’s 50,793 rooms (as of June 30, 2000) achieved an average market occupancy of 71.1% in 1999. The occupancy in the resort hotels differs significantly from the Santo Domingo hotels in that the latter operated at 67.3% occupancy while the resort properties reached 72.3%. However, the total annual Revenue per Available Room (RevPAR) in Santo Domingo, at $34,880, is far superior to the annual RevPAR in the resorts of the rest of the country, which reached $14,887. The 57% difference in this performance measure is the result of the all-inclusive marketing mode applied in most of the resort properties. Cancún’s almost 25,000 hotel rooms operated at average market occupancy of 79% in 1999, down from 88% a year earlier (based on 21,802 rooms) and 81% in 1997 (21,381 rooms). The hotels in the All Inclusive category outperformed the overall market, reaching occupancy levels 5 to 6 percentage points higher than the overall market. Occupancy levels tend to follow very traditional Caribbean markets, with strong occupancy in the northern hemisphere’s winter months, and lowest occupancy in the October through December period. Of particular note in Cancún is the popularity of this destination in the June-August period, with the average hotel occupancy being in the mid-80% range, higher than in the normally peak winter months. The increased occupancy is partially the result of strong European visitation, but is mostly attributable to visits by Mexican nationals on vacation. The average room rate for Cancún was $99.82 in 1999, down from $101.54 the year before although this lower rate is the result of changes in the exchange rate. The average rate actually increased from 935.18 pesos in 1998 to 943.35 pesos in 1999. Whereas Canada is the most important single source country for visitors to Cuba, with about 276,000 visitors in 1999, Europe, as a region, delivered 55% of the country’s total foreign travelers. In 1999, just over 880,000 Europeans went to Cuba, up from about 170,000 in 1990. Within Europe, Italy and Germany are the most important countries, with 161,000 and 182,000 visitors respectively in 1999. Tourism from Italy appears to have stagnated for the time being, with fewer visitors now than in 1996-98, when approximately 200,000 Italians went to Cuba. Spain is the fourth most important country, delivering 146,000 tourists in 1999, or 9% of the total. Following Spain was France with 123,000, England with 85,000 and Mexico with 70,000. Other countries are emerging as important source markets for Cuba, with tour groups from Japan, China and other Asian countries starting to show stronger presence. Europe also represents a critically important source of visitors to the Dominican Republic, with about 46% of the total 2,649,418 visitors in 1999, or slightly more than 1.2 million visitors. Germany is the largest source of tourism arrivals from Europe, generating 453,000 tourists, or 17% of the total; Spain and Italy both generated about 137,000 visitors, representing 5% of all visitors each. The North American market is the second largest group, with about 717,000 visitors, of which 500,000 visitors, or 20% of the country’s total foreign arrivals, were from the United States. Of note in the Dominican Republic is the fact that of the total 2.6 million visitors, half a million, or 19% if the total, were Dominican Republic nationals who currently reside abroad and visit their native country. Cancún received 2.8 million visitors in 1999, of which 54% originated in the United States, making this market by far the most important, although the absolute number of American arrivals has not changed significantly over the last three years. Next in numbers are Mexican nationals, which accounted for 28% of all tourists to the area last year, reaching almost 750,000 visitors. The volume of tourists from within Mexico appears to be the fastest growing segment in recent years, having increased by 35% from 550,000 in 1997 to last year’s volume of 750,000. Europeans accounted for 11% of total arrivals (15% of foreign arrivals), reaching 317,000 tourists, followed by South America with 108,000, Canada with 90,000 and other countries with 24,000. While the total number of visitors has increased from 1,454,433 in 1997 to 2,818,488 last year, there has been no increase in numbers from other countries or from Canada. Furthermore, the number of visitors from South America has declined by almost half, from 201,000 in 1997 to 109,000 last year. The real growth in arrivals has therefore come from the European market (10% increase in the two years), Mexicans (35% growth) and the United States (5% growth). It would appear as if the greatest growth potential among the three destinations rests with Cuba, although the future is necessarily tied to political and economic conditions and, to a certain extent, upon attitudes in both the United States and Cuba. In the event that the political environment changes for the negative in Cuba, or should investment attitudes by foreign parties take a different direction, then it is almost certain that Cuba’s tourism industry growth will also be affected. In order to explain why Cuba is likely to see the strongest growth, let us consider the destinations individually and examine the factors that could influence their performance. Cancún has been extremely successful at establishing itself as one of the premier resort destinations in the Caribbean. With almost 25,000 hotel rooms, many of which are of very high quality, and a year-round occupancy level that has consistently been in the low 70% to mid 80% range for many years, the area has clearly had a positive impact on the Mexican economy. The destination offers a wide selection of excellent hotels, convention facilities, numerous restaurants, bars and retail outlets, as well as access through an international airport located close by. However, in looking to the future, it must be remembered that Cancún is somewhat of an isolated area, with little tourism diversity outside of the “sun, sea and sand” experience (including water-based activities) or visits to nearby Mayan ruins. There is not a lot of cultural tourism or health tourism, while ecotourism remains somewhat of a gray area. Most importantly, however, is the high concentration of hotels in a relatively limited space. The development of hotel after hotel along the eastern and northern shores of Cancún Island will limit supply increases to infilling of isolated land parcels suitable for hotels. Land along the coast, to the north and to the south of the existing development area, is being cleared and prepared for new development, and a virtually endless number of new hotels could likely be added. However, it is also likely that the mere “sameness” of the extended destination area will detract from its appeal, while infrastructure and labor issues could also slow expansion. Considering the current inventory of almost 25,000 hotel rooms, and the reasonably limited increase in supply over the last 10 years compared to the other two destinations, it is unlikely that Cancún’s expansion potential over the next 10 years will amount to much more than 5,000 to 10,000 rooms. The Dominican Republic has extensive tourism growth potential, due in part to the large size of the country, its diverse tourism product offerings, and the availability of new development areas. The country boasts of having over 200 miles of firstclass beaches, as well as rainforests, mountains, and numerous historic towns and villages scattered throughout the coastal and inland areas. Tourism growth has been impressive, with the number of tourism arrivals increasing by 8.2% annually over the last 11 years, and the market share of Caribbean tourism growing from 9.6% to 13.0% over the same period. The Dominican Republic now has 2.6 million visitors annually, slightly below the 2.8 million recorded by Cancún but above the 2.1 foreign visitors to Cancún (i.e., not counting the over 750,000 Mexican tourists). The hotel supply is primarily categorized as “all inclusive” beach resorts targeted at the middle market. As indicated previously, 88% of the total national inventory of hotel rooms is classified as “all inclusive”; most are also located in the beach resort areas of Punta Cana, Puerto Plata, Samaná and other similar areas. A review of price quotes among many of the hotels throughout these areas indicate typical low season rates, including room, meals, beverages and certain entertainment and recreational activities ranging from $50 to $100 per person, increasing to between $110 and $150 per person during the peak season (for 4-star accommodations). The Dominican Republic has benefited from strong demand form the European market, while another 580,000 of the country’s 2.6 million visitors came from the United States. While growth from all market sources is expected, the key will be continued demand from Europe and the United States coupled with stronger growth from South America and other countries — this largely depends upon the continued improvements in economic conditions in these areas. There have been large numbers of new rooms added throughout the last 10 years, with almost 11,000 alone in the last 2 years, and almost 21,000 or more than 40% in the last 5 years. Additional supply has been a combination of national development and investment from foreign corporations including Sol Meliá, Iberostar, Club Med and Jack Tar. Future growth is expected to be quite strong, focusing on more “all inclusive” hotels, and some traditional noninclusive properties in both beach and inland areas where they can be supported by other commercial developments. The future growth in the Dominican Republic is also somewhat tied to the future of Cuba. In the event that travel restrictions between the United States and Cuba are lifted, it is likely that the surge in interest in Cuba by the U.S. market will detract from travel to the Dominican Republic. On the assumption that these restrictions remain in place, it is likely that there will be between 15,000 and 25,000 new rooms built in the Dominican Republic within the next 10 years. Cuba had become the fifth most popular tourism destination in the Caribbean region by 1998, following behind Puerto Rico, Cancún, the Dominican Republic and the Bahamas, just 10 years after re-entering the tourism market. Between 1994 and 1998, Cuba recorded the highest rate of growth in tourism arrivals of all Caribbean countries, with an increase of 129%; for the other large destinations, the corresponding growth rates were 31% for the Dominican Republic, 2% for the Bahamas by 2%, 12% by Jamaica and 11% for Puerto Rico. The very strong growth rates have been achieved as a result of the country’s ability to provide a large inventory of hotel rooms, several airports capable of accommodating wide-bodied aircraft, and a wide range of tourism products. The majority of the hotel inventory was, and continues to be, of average quality. The need to attract large numbers of tourists, the lack of professional staff, a mediocre quality food product and other similar issues forced the industry to target the less discerning traveler — this inevitably meant the mass market, which prefers package pricing. The growth in this market has provided the country with primary recognition as an inexpensive, all-inclusive destination. Within the past 5 years or so, introduction of new hotel concepts through joint ventures with foreign parties has allowed Cuba to begin changing this image. New traditional hotel developments in both beach resort and urban areas have generally been of a much better quality, with names such as Meliá, Novotel and Golden Tulip appearing. Also, the success of the SuperClubs Varadero hotel has initiated further discussions with this company to partner in other projects elsewhere in the country. There are numerous new development projects in various stages of development, although the majority are still in the preliminary study and financial evaluation stages. Based on discussions with Ministry of Tourism representatives and other Cuban officials, we estimate there to be about 10,000 rooms presently under serious consideration for development (with formal announcements having been made). There are also numerous other projects in the early stages of review and planning. The government has announced plans to develop as many as 172,500 rooms by 2010, effectively requiring the construction of an average of 14,000 new rooms every year. This very aggressive rate of expansion assumes all U.S. travel and trade restrictions will be lifted and over $22 billion will be available for investment in hotels alone, with much of this coming from U.S. and other foreign corporations. Based on current conditions, it would appear that the travel limitations between the U.S. and Cuba are likely to remain in place for at least another year or so, suggesting that the number of new rooms in the short term will be less than 14,000 per annum. Conversely, it suggests that over the mid to longer term, the rate of addition will need to surpass by a large number the 14,000 average, having to reach 20,000 or more. As indicated previously, Cuba has improved its share of the Caribbean market from only 2.7% in 1988 to 8% in 1999. The growth in tourism arrivals is likely to slow in the upcoming years, being unable to maintain the torrid rate of the last 10 years. With a rate of growth of, say, 13% annually for the next 5 years, the number of arrivals would increase to 3.3 million by 2005. If Caribbean tourism grew at the same rate as in the past 10 years, it would reach 31.3 million arrivals in 2005, and Cuba would hold a 10.5% market share. If occupancy levels, average length of stay and number of guests per occupied room were not to change, Cuba would require a total of 66,000 rooms, or the addition of 33,700 over the level today. This initially appears to be reasonably realistic, except when considering the actual level of increase over the last 5 years has only been a total of 9,000 rooms and the process from initial consideration of a project through construction tends to be quite slow. With this in mind, we estimate there will likely be between 10,000 and 15,000 new rooms added over the next 5 to 7 years. While the number of new accommodations for foreigners is likely to be less than expected by the government, the quality is expected to be far superior to what is generally available today. We expect the introduction of timeshare and resort villages will begin to change to typical Cuban hotel image, and while all inclusive destinations will continue to be crucial components of tourism travel, we also expect to see several new commercial hotels in major urban centres, particularly Havana. • They are competitors primarily in the “all inclusive” market segment. • Since its inception, Cancún cultivated the U.S. market as its principal source of demand for room accommodations. In general, Dominican Republic hotels, mostly owned and operated by European interests, did not pay much attention to the U.S. market until recently when more upscale properties were developed to satisfy this market. Cuba followed the Dominican Republic in targeting the same sources of demand for hotel rooms but cannot access the lucrative U.S. market except at a minimal level. To conclude, Cuba’s extraordinary effort in developing a tourism infrastructure and reasonable success in attracting a growing number of visitors, suggests that the economic “embargo” from the United States has not precluded the island from achieving its present position in the Caribbean tourism market. While this issue is argued by both sides for internal and external political reasons, there is little doubt that Cuba would further benefit from a share of the U.S. market’s enormous source of potential visitors. 1. “All inclusive” is a modality of the hospitality industry where clients pre-pay a fixed amount for one or two weeks of accommodation including food, beverages, entertainment and gratuities and, frequently, air and ground transportation. Payment is generally made to a travel agent or “wholesaler” who then pays the hotel for its services. The traveler usually flies on a chartered aircraft rather than on a scheduled flight.